I am currently working on putting together a new stunt bike and have decided to go with the classic Streetfighter design. To do this I knew I was going to need a new triple clamp that allowed me to adapt dirtbike handlebars. For an engine, frame and suspension I decided to use a Yamaha RZ 350. Although this bike was made in Canada and Europe until a few years ago, it was discontinued in the US in the mid eighties, which makes aftermarket accessories hard to find. 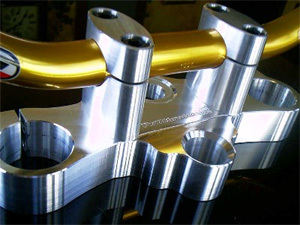 I began my search on for a triple clamp on Google.com hoping to find a European company that could provide me with such a part. I had no luck and almost gave up looking when I received an email with a link to Full Throttle Inc. in Indiana. I visited their website and regained hope when I discovered that this company fabricated custom CNC triple clamps. I called them up and spoke with the owner Bill who assured me that they could deliver exactly what I need. He also told me he could get me my part quickly so I decided to place an order. Within a few short days my triple clamp was manufactured and sent out to me. When I received the part, I opened the box to discover one of the most beautiful pieces of metal I have ever seen. The part is cut from 1 1/4" thick 6060 T6 aluminium with the utmost attention to detail. Every inch is machined perfectly and the finish is outstanding. I have now put it on my bike and the fit is perfect. I am thrilled to have done business with Full Throttle Inc. and will continue to use them in the future. It's nice to find a company that works hard for their customers and actually delivers what they promise. Next time you are in the market for a new triple clamp, mirror eliminators, motor mounts or any custom CNC work, check them out. You will be thrilled with the cost, quality and customer service.